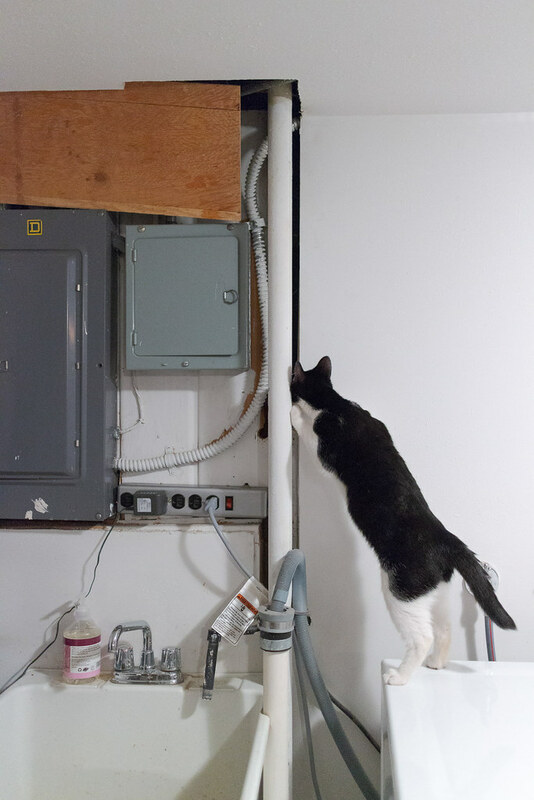 While Boo’s black-and-white coat resembles Scout’s in some ways, it was his early attempts to get up into the ceiling and ducts that reminded me most of her. Up above you can see a board above the circuit breakers, placed there when we moved in over a decade ago to keep Scout out. It was a constant battle in those early days, we’d block off access to one spot and she’d find another. She was crafty so it usually took multiple attempts to block her out for good. Scout was already full grown when we moved in so skinny little Boo was able to find one spot into the ducts that we hadn’t blocked off but that was soon rectified. He got dirty during his foray but we had learned from past experience to let him clean himself. I didn’t use to believe in superheroes, ordinary people one moment who in a flash could transform into something greater. 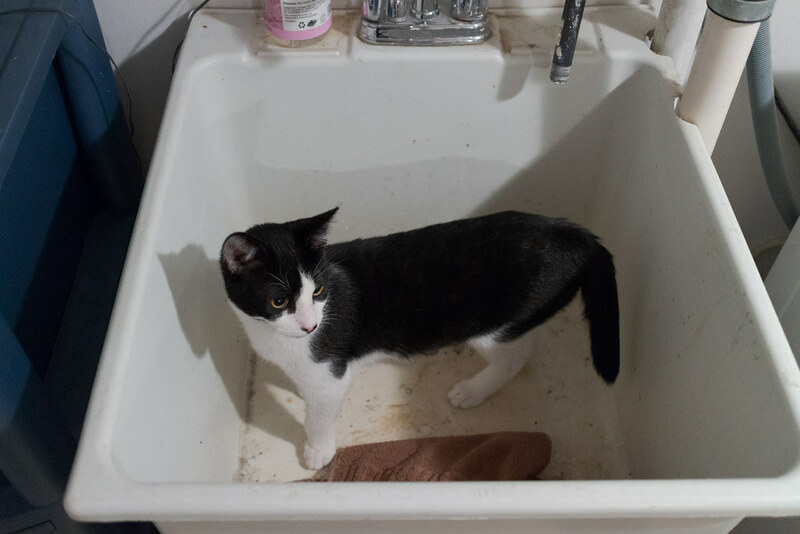 But one day after sneaking into the ducts Scout came out looking like a furry little coal miner, so I gave her a bath in the same utility sink Boo is standing in above. The moment the water hit her fur, my sweet little girl grew ten legs, each ending in a paw with a hundred claws. Some sought for purchase as she tried to wiggle from my grasp, leaving the others free to flail wildly and attack whatever they could. She dug into my hands, my arms, my chest, and rather painfully into my nose. That’s me below holding Scout after her bath, drying her off with a towel. Fortunately Scout couldn’t hold a grudge, not even for a moment, so she quickly forgave me and we never spoke of it again. This entry was posted in Pets and tagged basement, black-and-white cat, Boo, cat, kitten, preening, Scout. Bookmark the permalink.